As top relief prospects Grant Dayton and Nick Wittgren continue to dominate at their respected levels in the Marlins minor league system, there are others looking to prove that they should be considered as the next arms to hold down wins out of the Marlins major league bullpen. So hold in your prospect drool as we breakdown the Best of the Rest in the Marlins minor league bullpens. With the High-A Jupiter Hammerheads in 2014, Suggs allowed 25 walks, six wild pitches and seven hit batsmen – while pitching 58 1/3 innings in 46 appearances. These statistics represent the same erratic tendencies on the mound that he showed in 2013 after signing with the Marlins and being promoted to High-A where he allowed 14 free passes in 18 1/3 innings, facing a total of 79 batters out of the pen. Going forward, Suggs, who is ranked this year as the Marlins’ 17th-ranked organizational prospect by MLBPipeline.com, will need to find consistency in his mechanics and mental make-up. If he can master control of his devastating curveball the can be a force to be reckoned with, especially when paired with his above-average fastball that sits 93-95 on the gun. Honing in on these skills will help to put Colby Suggs back on the fast track to the big leagues, and make him one of the top relief prospects to watch in the Marlins minor league system this season. It’s no secret that Ellington possesses the raw tools and arm strength to be a top tier reliever in the big leagues, especially when armed with more off-speed offerings than any other relief pitcher in the farm system. Like every prospect though, there is always a downside – and right now Ellington’s is his inconsistent command of the strike zone, which can be attributed to his lengthy delivery. This is something he will need to work on this season if he wants to see a promotion to Triple-A New Orleans. Looking at the stats above for 2015, if Ellington can continue to keep his walk rate down, which currently stands at 1.72 walks per nine innings pitched through 9 appearances, then we could see him develop into a late inning set-up guy at the major league level for the Marlins – making him a strong bullpen candidate to watch down on the farm this season. Not only does this state that Del Pozo has made drastic improvements on the control front, but he is continuing to make a name for himself outside the Marlins front office. With Grant Dayton and Nick Wittgren in line at Triple-A in front of him to be the next relievers to hit the big leagues, Del Pozo will need to put together another strong statistical resume during his 2015 campaign in hopes of landing a spot in the Marlins bullpen behind front runners like Dayton and Wittgren. Milroy made huge strides in 2014, splitting his time starting and relieving out of the Grasshoppers bullpen. He registered 12.36 strikeouts per nine innings pitched and dropped his astounding 5.18 walk rate from the previous season – down to 3.27 before being promoted to High-A Jupiter. This promotion featured Milroy as a starter out of the pen and brought back images of his erratic control problems- he finished his High-A campaign in 2014 with a 6.84 walk rate and minor league career low 6.66 strikes out per nine innings pitched over 50 innings. With all his struggles with control as a starter, Milroy seems to be slowly finding a place as a fast track prospect out of the bullpen. With a low 90’s fastball that can touch 95 MPH on occasion and a wicked late-breaking mid 80’s slider, pitching out of the pen would certainly allow his pitches to play up – as seen in his 2015 stat line above. It will also allow Milroy to develop his change-up into an above-average third offering, while continuing to be successful with his fastball-slider combination in late in relief without any setbacks. It’s still too early to tell whether Milroy will end up as a starter or reliever by the time he makes the big league roster, but the 6’2″ 190 lbs. right-hander has the pure stuff and mound moxie to create a lot of swings and misses if he can continue to harness his control issues. Josh Hodges/6-foot-7 235 lbs./Drafted by the Marlins in 2009 (11th round) out of Ingomar Attendance Center High School in New Albany, MS.
Esmerling De La Rosa/6-foot-2 202 lbs./Signed with the Marlins in June 2009 out of Santo Domingo, DR.
Nick White/6-foot-3 205 lbs./Drafted by the Marlins in 2014 (11th round) out of Berryhill High School in Tulsa, OK.
Kyle Porter/6-foot-2 205 lbs./Drafted by the Marlins in 2014 (31st round) out of the University of California. It’s no secret that the Miami Marlins bullpen has struggled to hold down leads for the Fish this season, contributing to 4 of the Marlins 14 losses, and is armed with just three relievers with a FIP below 3.00. 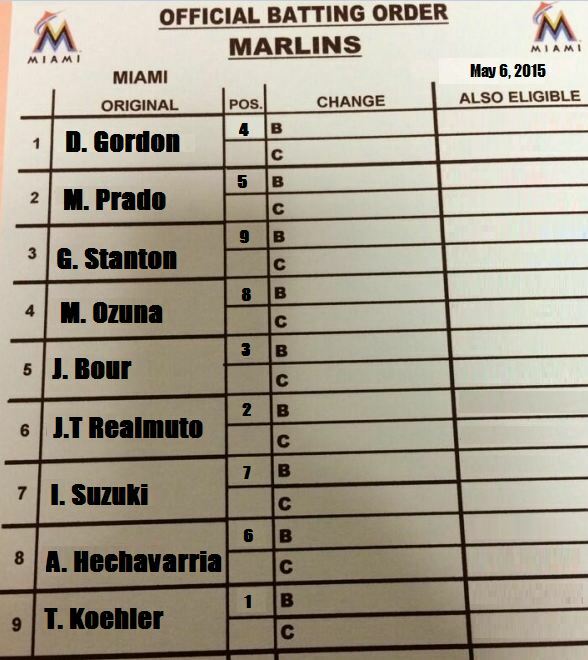 As of this moment, the only bright spots in the Marlins major league pen are A.J. Ramos, Sam Dyson and Nick Masset. The brightest spot of them all so far, is of course, A.J. Ramos. He has thrown well so far posting a 1.65 FIP while stranding 84.6% of runners on base in 15 innings pitched, continuing to pound the strike zone with his three main pitches – Fastball, Slider and Change-Up. He has also brought back his Cutter, which hasn’t been seen in his repertoire since 2012. If Steve Cishek continues to struggle in the closer role, look for Ramos to have his name called again this season to step up and close out wins for the Marlins. With that said, the Fish have built their major league bullpen around their farm system since the disastrous season in 2012, which leaves us scouring the Miami Marlins minor league farm system in search of the prospect with the “Next man up mentality”. Before diving into the hidden gems in the lower levels of the Marlins farm system, it’s important to note that names like Carter Capps, Matt Ramsey and Andre Rienzo are all listed in the bullpen for Triple-A New Orleans. These are the four-A bullpen guys for the Marlins that add quick fill in value if someone goes down in the major league pen. At Double-A Jacksonville though, the Best of the Rest really start to shine – as we look at the Best reliever prospects pitching in the Marlins minor league system in 2015. Almost a complete unknown in the Marlins baseball community, Logan stands to make a name for himself this season. Drafted in the 2012 MLB draft (13th round) out of Eastern Oklahoma State Junior College, Logan – standing at 6’1 225 lbs. – dominated at the junior college ranks, posting a 11-2 record as a starter with a 1.55 earned run average and 124 strikeouts in 93 innings pitch. These statistics had him set to be the ace at Wichita State the following season, had the Marlins not drafted him that year. In his first season of professional ball Logan seemed to pick up right where he left off in college – going 1-2 (W/L) with a 2.56 FIP and 29 strike outs in 31 innings pitched as a starter for the Batavia Muckdogs. Unfortunately though, things fell apart for Logan in his first full season of pro ball in 2013 as made the transition from starter to reliever at Low-A Greensboro. He finished that season with a 4.61 FIP – with opposing hitters registering a .333 BABIP against him at the plate. Control seemed to be the issue as he walked 20 total hitters and hit 8 in that same season. Logan has started this season with Double-A Jacksonville and has looked to continue the same kind of success seen from him in 2014. Unfortunately though, up to this point, Logan has post a 4.82 FIP and has given up 2 home runs in six appearances. This stat should drop as he receives more seasoning at the Double-A level, making him a top candidate to watch out of the bullpen in the Marlins’ minor league system this season. Acquired by the Miami Marlins this off-season in a trade for Casey McGehee from the San Francisco Giants, the 6’2″ 170 lbs. string bean Castillo brings the same kind of electric arm as trade mate prospect Kendry Flores. With a Fastball that sits in the mid-90’s, Castillo put himself on the map with the Giants rookie ball affiliate in 2013, recording 20 saves in 27 appearances with a 1.12 FIP and 34 strikeouts. He kept hitter’s bats at bay- posting a .221 BABIP and 3 walks after facing 106 batters at the end of his 2013 campaign. All this just 2 years after signing a free agent contract with the Giants out of Bani, Peravia, Dominican Republic. At the age of 22, Castillo still has a lot of seasoning ahead of him before making the leap to the Marlins major league pen. So far though, the Marlins front office like what they see from this potential future closer. The hope is that he will continue to add body mass and durability to his wiry frame. Castillo is off to a good start this season at Low-A Greensboro. He has collected 2 saves in 8 appearances while striking out 15 over 13.1 innings pitched, as well as flashing his advanced control walking .66% per nine innings pitched – which is down from his 3.84% in 2014. If Luis Castillo can continue to make improvements as he moves up the ranks of the Marlins minor league system, the 22-year old righty could find himself on the fast track to the Marlins big league roster if we continue to see veterans and four-A call-ups struggle. Sean Donatello/6-foot-2 205 lbs./Drafted by the Marlins at the age of 20 years-old in 2011 (25th round) out of the University Connecticut – Avery Point. Steven Farnworth/6-foot-2 108 lbs./Drafted by the Marlins at the age of 20 years-old in 2014 (23rd round) out of Cal Poly Pomona University. After purchasing Lexus President Club tickets (Pretty Expensive) at Nat’s ballpark on Stubhub.com yesterday afternoon, Marlins advocate Jason Tate thought he was finally going to live his dream – Purchasing two tickets for his girlfriend and himself to sit in the Luxurious all-inclusive section right behind home plate (its like winning the Lotto). Unfortunately, when Jason got to the park to watch Marlins batting practice, he nor his girlfriend could get through the gate. They were directed to the Ticket service center at Nationals Park, where they were told that the tickets they purchased were put on Stubhub.com with a stolen credit card and the tickets were voided by Nationals officials. The couple was now told, that if they wanted to attend the game they would have to buy tickets at the gate to be admitted (after receiving no info/refund from Stubhub for their Lexus President seat purchase). After being completely deflated, dreams crushed, the couple was determined to see the game no matter how far away – buying two cheap nosebleed seats in CF. Jason of course, was still determined to get as close to his team as possible and make the best of a bad situation, so the couple left there far out sits to hang around the Marlins bullpen for the evening. Even with the deflated feeling, the couple fought the frawns of what could have been to get behind their teams, especially Jason, who spent the whole night lounging by the bullpen to motivate his team. Even with Giancarlo Stanton at the plate in the 9th with two outs and a full count, Jason was pumping up Nick Masset saying, “Take it to them! Stanton’s going long here, be ready!”. Words like that were echoed throughout the Marlins Bullpen all night, as Jason stayed determined to make the best of it. Editor’s note: I want to thank Nick Masset for being a class act and a great representation of what being a baseball player is all about. Of course its about winning and being the best, but as some often forget its about the fans – the one’s who support you no matter how many games you lose or win, no matter how wet, how cold and how hot. Thank you Nick Masset, A.J Ramos, Bryan Morris, Sam Dyson, Mike Dunn, Steve Cishek and the rest of the Marlins bullpen for proving why everyone should be a Marlins fan. I hope one day I can watch you guys mow down the competition from behind home plate! As I mentioned last week in Pt. I of the 2015 Miami Marlins minor league depth at the outfield position, Giancarlo Stanton, Christian Yelich and Marcell Ozuna are set in stone as members of the Marlins outfield for the future. Four-A players provide the supporting cast as they roam the gaps at Triple-A New Orleans – Brady Shoemaker, Austin Wates , Cole Gillespie and the versatile Jordany Valdespin. These players don’t help predict how bright the Marlins future truly is, but they do provide fill in value at the Major league level to keep the team competitive for the 2015 season. Austin Dean and Isael Soto were highlighted in last week’s article as two of the best top prospects in the Miami Marlins minor league system playing the outfield position. Dean and Soto aren’t the only two outfield prospects that deserve mention – so, as I alluded to last week in my article, here are the Best of the Rest down on the farm for the Fish at the outfield position. Listed as the Miami Marlins #15 organizational prospect by MLBpipeline.com heading into the 2015 season, it’s clear that the Marlins front office and fans alike are just as high on Soltis’s offensive capabilities as they are with his defense capabilities. Primarily listed as a centerfielder, Soltis has the strong arm and above average speed that will allow him to play all outfield positions – including right field. On the offensive side of the ball, Soltis has a quick compact swing that promotes line drives to all parts of the field – at the same time showing an advanced level of comfort at the plate for a teenager. The biggest skill set to pay attention to in Soltis’s game this season will be to see if he can develop the Hawkeyes (advanced plate vision) approach at the plate. This will bring down his 23.9 strikeout percent at the plate in 2014. It will also foster better pitch selection and lead to a higher overall average at the plate as he is promoted throughout the Marlins minor league system. It should also help him tap into some of that raw power we are yet to see from him at this point in his early minor league career. Even if his power numbers were down in 2014, Juengal still put together a top prospect like slash line for the Hammerheads – .272/.330/.393 with 32 doubles. These statistics supported his end of year promotion to Triple-A New Orleans, where he flashed his power hitting one home run in a limited 13 plate appearance. If he can continue to work on shortening his swing at the plate, while still producing the kind of massive pop he is prone to generate from his swing, then we could see him up in Triple-A by the end of the season. With sub-par to average defense capabilities, it will be Juegnal’s right-handed bat that gets him promoted up to the big leagues, so continuing to work on his craft at the plate will be of the utmost importance to him this season. Off to a hot start, Juengal has already hit 4 home runs in 74 plate appearances with a .246 BABIP for Double-A Jacksonville this season and will look to continue that hot stroke for the rest of his 2015 campaign – in hopes of becoming a September call-up at seasons end. Listed on the Marlins depth chart as an outfielder, Seymour has the speed to make up for mistakes with his developing footwork in the outfield. This also makes him a threat up the middle as an infielder – playing at shortstop in 9 out of his 26 games played. This is a position the Marlins like seeing him at – with his fluent hands and above average arm. Rated as the Miami Marlins organizational #28 top prospect by MLBpipeline.com, Seymour will have his work cut out for him when he hits the field in 2015. He will hope that his speed and slap happy hitting approach can place him on the fast track to the big leagues, but will need to continue his polish to possibly become the next Jarrod Dyson or Terrance Gore. Their speed has allowed them to develop in the big leagues with the Kansas City Royals, and could do the same for Seymour – who could double as a utility infielder. With everything being even, Seymour, with his speed, definitely shines in a pile of solid outfield prospects in the Miami Marlins minor league system. If we believe that he could develop into another super utility player down the line, you have another highly touted outfield prospect to follow this season, – one that should find his way to Low-A Greensboro before the end of his first full season of pro ball in 2015. Cameron Flynn/6-foot-0 190 lbs./Drafted by the Miami Marlins in 2012 (23rd round) out of the University of Kentucky. John Norwood/6-foot-1 185 lbs./Signed a free-agent contract with the Miami Marlins in 2015 out of Vanderbilt University. With Adeiny Hechavarria holding down the shortstop position at the big league level, Miami Marlins fans seemingly have nothing to worry about. His 2014 campaign earned him a .323 BABIP with 10 triples (2nd in NL) and a ranking as the second best defensive shortstop in the MLB behind the Atlanta Bravesshortstop Andrelton Simmons. If Hechavarria can continue to swing the hot bat we saw in the second half of last season, then the Fish might have just found their shortstop of the future. Making highlight reel plays on defense and driving the ball to the gaps at the plate have slowly started to become part of Hech’s M.O. With that being said though, should Hechavarria struggle at the plate like he did in 2013 – slashing .227/.267/.298 – on a team that is in need of offense in 2015, or go down with an unforeseen injury, then the Marlins will most likely look to fill the position with stop-gap Triple-A options Miguel Rojas, Reid Brignac and Jordany Valdespin, receiving aid from Donovan Solano off the bench occasionally as the Marlins homegrown ultra-utility player. Should those options dissatisfy you as a Marlins fan, don’t worry, hope is not lost. The Marlins have a bevy of minor league talent at the shortstop position, so let’s take a look at the Best of the Rest. After turning 25 years-old this off-season, Nola will have to continue his year-in-year-out improvements to stay atop the many other talented shortstop prospects in the Marlins minor league system if he hopes to be the next shortstop in the minor league system to crack the Marlins major league roster. Even with a healthy Adeiny Hechavarria holding down the shortstop position at the big league level, Nola could find time playing behind either he or Dee Gordon at second base – where he was showcased playing with the Marlins in spring training. At his late age though, it’s unclear how much more leash the Marlins will be willing to give Austin Nola, but if he can carry over his Arizona Fall League plate approach where he finished with a .311 BABIP in 59 plate appearances while striking out just three times, then the Marlins will be hard pressed not to find a spot for him in future major league lineup cards. These are all true facts when assessing Justin Bohn’s play up to this point in his minor league career. He won’t burn the opponent on the base paths and won’t wow you with web gem plays up the middle. However, if he can continue to consistently perform at the plate and make the easy plays look easy in the field, we should see Bohn promoted as high as Double-A Jacksonville this season – barring any unforeseen injuries. He was also able to showcase his defensive versatility. Labeled primarily as a second baseman coming out of college, the Marlins have had Riddle playing all over the infield – primarily on the left side seeing time at third base, but mostly at shortstop. Riddle started at shortstop in 58 games for the Greensboro Grasshoppers in 2014, flashing his strong arm while finishing with a .958 fielding percentage. This should convince the Miami Marlins front office and prospect gurus that with a little more growth and development in the minors this year, MLB.com’s Miami Marlins #21 prospect J.T Riddle, in just his second full season of pro ball, could be heading for a breakout season in 2015 – right behind the Marlins highly touted infield prospect Justin Bohn. Despite having a .327 BABIP in 179 plate appearances, there is still a lot of room for development in Twine’s game defensively as well as offensively with his approach at the plate. Striking out 52 times and only walking 6 while continually fine tuning his craft at shortstop, makes him more of a project prospect than a fast-track prospect in the Marlins minor league system at the early age of 19 years-old. Although, if Twine can use his exorbitant amount of athleticism to quickly master the shortstop position, with his already solid build and raw talent potential he could quickly dash the “project” tag and put himself on the prospect fast-track to the Marlins major league roster. Javier Lopez/6-foot-3 185 lbs./Signed with the Miami Marlins at 17 years-old in 2012 out of San Gregorio de Nigua, DR.
Danny Black/6-foot-3 180 lbs./Drafted by the Miami Marlins in 2010 (14th round) out of the University of Oklahoma.